Sea Stars Gets Friendlier With Pets! 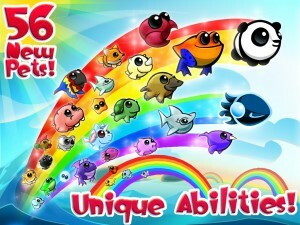 VANCOUVER – August 13, 2012 – Hothead Games is excited to launch an adorable update for their mobile swimming sensation, Sea Stars. With over 154 million swims started and 1 million characters mastered to date, they decided it was time players invited more nautical friends to their aquatic adventures. In update 1.5, players will be introduced to 50 different pets committed to helping break records in distance swam and coins collected! All pets can collect missed coins, snag sea stars and clams for extra power ups, and even remove hazards! To maximize maritime money power, Hothead has also introduced Sand Dollars that can be earned or purchased to access premium items and characters. Download Sea Stars on the App Store and Google Play today to meet the pets! Hothead Games is an award-winning, independent games development studio founded in 2006. Focused on developing and publishing high quality games for iOS and Android, our AAA console gaming pedigree affords us the skills and experience necessary to take mobile games to the next level.